One of Central New York’s premiere Mobile DJ Services, Sound Decision offers a highly professional, but affordable Disc Jockey option for events of all kind. Looking for a traditional music service that doesn’t overpower your event and respects your wishes? Our goal is to provide a professional service that accommodates your needs throughout the process, not just the day of your event. We can share our years of experience, working hundreds of events, to help you plan a day to remember for a lifetime. Not everyone is looking for lit-up DJ tables with large flat screen TVs on each side atop lighted columns. Sound Decision works to keep expenses low to offer a quality music service that won’t break the bank. Let us help you plan an event where the thing that shines the brightest is you! Finding the right DJ service is important! To understand your wishes, we’ll work together prior to your event and establish the music selections desired to create the atmosphere you are looking for. We believe your guests are there to share a special moment with you and we’ll work to keep you the center of their attention. If you’re looking for a DJ that runs around in funny hats and blow-up guitars, we’re not the right DJ service for you. Live bands are great, but a professional DJ service can offer a variety of artists, genre and styles to create a fun, vibrant atmosphere. You might need festive, upbeat background music during your cocktail hour, then uplifting, beautiful background music during dinner, followed by the hottest hits from yesterday and today to pack the dance floor throughout the rest of the evening! With over 15 years experience, we understand the importance of constantly monitoring your event for the right tempo and using the power of music to move people according to your planning. With over 30,000 song titles in our library, you can choose from Oldies (50’s & 60’s), Motown, Classic Rock, Disco, 70’s, 80’s, R&B, Club, Hip Hop, Alternative, Reggae, Country, Jazz, Standards, Classical, Big Band, Swing, Top 40, Songs of Special Interest and much more. 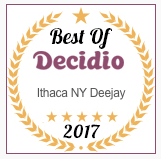 Based out of Ithaca, in Upstate New York, Sound Decision is conveniently located to cover all of the Finger Lakes Region and Northern PA.
Our package pricing includes set-up and breakdown time (you only pay for the time we are playing music.) Travel up to an hour from the Ithaca area is also included, as well as effect lighting for the dance floor area. Because of the many spectacular state parks, waterfalls, wineries and venues throughout the Finger Lakes, we are often asked to help provide music and microphones for wedding ceremonies prior to the wedding reception. Electrical power is not always available in these locations, so we’ve developed a second, smaller system to operate on our own portable power for proximately 2 hours when needed. 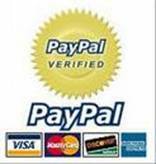 We are fully insured and bring backup equipment to every event! When searching for a DJ service, ask how they would keep the music flowing if their computer failed, if a speaker dies, or even if there is a temporary power outage? Is the person working your event the owner of the business and is personally invested in the success of your event or just some college student that shows up on the weekends? 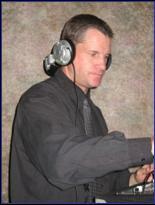 Does the DJ service offer a contract to protect your planning? Every year we receive calls from frantic couples a month before their wedding date looking for a new DJ because the “big city” service they thought they hired has canceled and they didn’t have a contract. In most cases, at that time, we’re unable to help because we’re already booked on their date. Protect your planning!